The following essay is excerpted from Love Can Be—A Literary Collection About Our Animals. Every year, millions of monarch butterflies migrate from Canada to Mexico, where they spend their winters. They face many perils along their nearly 3,000-mile journey: unpredictable weather, pesticides, low supply of milkweed, loss of habitat. Despite the traumatic experiences before, during, and after the journey, the monarch knows that its migration is the only way to ensure the survival of the next generation, and the next. As a former undocumented immigrant, I have long admired the monarch butterfly’s will to live. For the monarch and for me and for the millions of people in the world forced to leave their homelands, migration is an act of survival. The monarch butterfly has become a powerful symbol for the undocumented immigrant community. It serves as a reminder that every living thing on Earth deserves to thrive in peace and harmony, that for both insect and human, migration is not a crime but a necessity. In my garden in Los Angeles, I planted milkweed and other flowering plants to provide a safe haven for the local monarch population and do my part in protecting this magnificent creature. 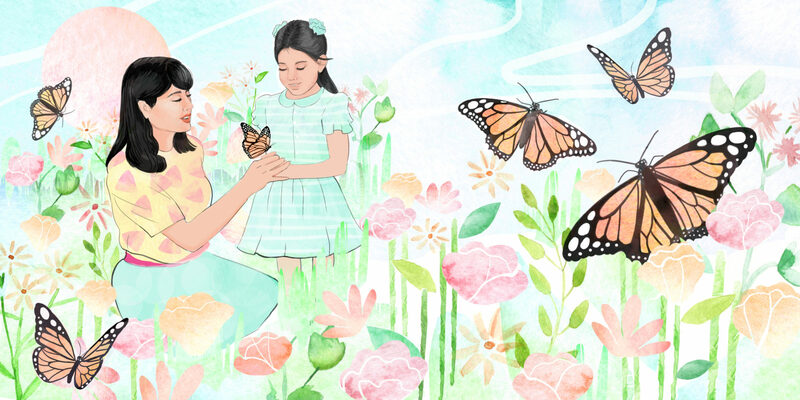 I shared my love of gardening with my daughter, Eva, who was seven years old at the time of this story, and while we weeded or planted bulbs, I would talk to her about the plight of the monarch population. I told her that twenty years ago, over a billion monarchs would make the journey south. Now their numbers are at the lowest they’ve ever been. As with all migrants, their struggle to survive is harder today than ever before. We humans are plowing away more and more land, leaving no room for milkweed or nectar plants, spraying harmful pesticides on our farmlands, and cutting down the forests where the monarchs spend their winters. “Something needs to be done,” I told my daughter. Eva said that she would grow up to be an entomologist. “I’ll save the monarchs,” she declared. She squealed in delight every time a butterfly visited our garden. I explained to her that they were laying eggs in the milkweed we had planted for them. When we watched a documentary about butterflies, Eva could no longer wait until she grew up to save them. She had to start that very day with our local population. She wanted to carry out a rescue mission to save the monarchs from the only threat she could see in our pesticide-free garden—predators. Eva and I began to gather the milkweed leaves that had tiny eggs attached to their underside and put them in containers, safe from the spiders and praying mantises that lived in the garden. Once the caterpillars were grown, we transferred them to a butterfly habitat where they pupated before our eyes. Those three minutes of watching a yellow-black-and-white-striped caterpillar transform into a brilliant emerald-green chrysalis were magical. We gasped at seeing the tiny gold spots and a golden ring shimmering around the chrysalis. Standing beside my daughter, I felt connected to her through this shared experience. We’d been part of the cycle of life of this precious insect and bore witness to its metamorphosis. One September day, one of the caterpillars did not attach itself securely enough to the roof of the butterfly habitat. In the middle of pupation, the chrysalis fell to the floor, and when we found it, one side was flat. My daughter and I used tape to hang the cocoon as carefully as we could, but when the monarch emerged from its chrysalis, its right wing was shorter than its left. “I’m afraid we can’t release it,” I told my daughter. “She won’t be able to fly.” A healthy monarch had a difficult road ahead in her fight for life. A monarch who couldn’t fly was doomed. “I will teach Buttercup to fly,” Eva said. I didn’t have the heart to tell my daughter that it was not possible. How could a human teach a butterfly to fly, especially one with a severe disability? Every day, Eva would take Buttercup out to the garden and place her on the butterfly bush to drink nectar and enjoy the sunlight. She would sit Buttercup on her index finger and raise her hand up and down to get wind under Buttercup’s wings. Buttercup would take off into the air only to fall seconds later. Eva would pick her up from the grass and try again. For several days, Eva put out fresh orange slices for Buttercup, and when the sun had warmed the garden, she would take her out to eat nectar and practice flying. I watched from the window, wondering how to prepare my daughter for the inevitable. Buttercup would spend the rest of her too-short life with us. She was never going to fly. This butterfly, like me, had been born to struggle, something that my children knew nothing about. I had been born with a great disadvantage, too—an undocumented child immigrant from Iguala Mexico, in the state of Guerrero, where 70 percent of the population lived in poverty. No one thought I could escape the circumstances I had been born into. But I had. Just like the monarch leaves her home to give her offspring a chance, I had left the country of my birth, risked my life to cross the border, and made the impossible possible—I went from being an undocumented immigrant to a successful published author. Because of my own migration to seek a better life in the U.S., I spared my children the trauma of being born in a shack made of sticks and cardboard, living without running water, walking around barefoot for lack of shoes, being hungry in every way. I spared my children the trauma of running across the border, the paralyzing fear of being caught and sent back or, worse, of perishing in the act of crossing. My children will never know what it’s like to be labeled a “criminal” for simply wanting a better future, a chance to dream. They will never know the stigma of growing up undocumented, the trauma of trying to hold on to your roots while trying to assimilate into a new culture. They won’t know the searing pain of a heart as it cleaves in two, fighting to maintain its Mexican identity while transforming into an American. Like my story, the monarch’s is one of struggle and survival. As I watched my daughter share the fight with Buttercup and learn of perseverance and faith, I hoped that her love for this butterfly would be the magic formula that would help Buttercup fly. A few days later, from the living room window, I watched my daughter do her usual routine. When she placed Buttercup on her finger and raised her hand up, Buttercup took off and soared into the air. I was expecting her to fall back down, but this time she didn’t. She flew across the garden and over the neighbor’s fence. I don’t know where Buttercup ended up. My daughter believes that her butterfly defied fate and went on to have a fulfilling life. I was happy to know that at least for this one moment, my daughter might have had a glimpse into my life. She witnessed firsthand what it’s like to rise above the circumstances one is born into and find the strength to survive. Reprinted by permission of the Kirkpatrick Foundation and Reyna Grande. All rights reserved. Reyna Grande is an American Book Award–winning memoirist and novelist. Other titles by Grande include The Distance Between Us, Dancing with Butterflies, Across a Hundred Mountains, and her latest memoir, A Dream Called Home (October, 2018). In 2015, she received a Luis Leal Award for Distinction in Chicano and Latino literature. Additionally, Grande’s books have been featured in common reading programs throughout the United States. Her essay “A Migrant’s Story” can be found in the recently released anthology Love Can Be: A Literary Collection About Our Animals. All net proceeds of the collection will go to animal charities.